Chris Hillman, Rock And Roll Hall Of Famer and original member of the legendary sixties band The Byrds, The Flying Burrito Brothers, and The Desert Rose Band, reminisces with Illumined Heart host Kevin Allen about his 40 years in the music business and the spiritual journey that led him to the Greek Orthodox Church. Fr. Pat discusses Peter walking on the water. 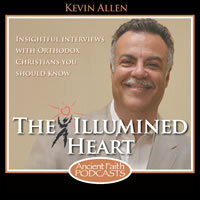 Kevin Allen: Welcome to the Illumined Heart on Ancient Faith Heart Radio. The music behind the intro of this episode was Turn, Turn, Turn by the legendary rock band The Byrds. The Byrds: Roger McGuinn, Gene Clark, David Crosby, Michael Clark, and my guest today on the program, Chris Hillman were pioneers in a wide range of musical genre’s in the 1960’s and the early 70’s. I know that gene-X and gene-Y are still listening to the music as many of us do. Chris Hillman is personally credited as a pioneer, and innovator of the country rock genre although he assuage such labels as he may tell us. Chris Hillman began his professional career with The Byrds as a guitar and mandolin player turned base player from San Diego California. His musical career spans over 40 years as a musician, arranger and song writer and along with The Byrds, Chris Hillman was inducted into the rock and roll Hall of Fame in 1991. Well less known than Chris’ illustrious musical history is his spiritual history. Chris is a convert to Orthodox Christianity and is a member of St. Barbara Greek Orthodox Church in Santa Barbara California, where he is a member of the parish choir and we will be speaking about his music today, his life experience and of course his journey to Eastern Orthodox Christianity. Chris Hillman it is really a pleasure and an honor to have you as my guest on the Illumined Heart. Chris Hillman: Thank you Kevin, my pleasure. Kevin: Where did you grow up? Chris: I grew up Kevin I was born in Los Angeles in 1944. My father moved us down to a very rural part of San Diego which referred to as San Diego County in around 1948 and I have an older brother, an older sister and a younger sister, so there are four of us in the family. We settled in a town about 800 people at that time. I had the wonderful pleasure of growing up in one of the greatest times to ever be alive was the 50’s. Growing up at post World War II era, let me put it this way Kevin, we didn’t lock our doors. We were brought up with a sense of civility towards one another in respect. I credit my parents, although we didn’t have a very formal religious background but they did instill in all of us a sense of morality, a sense of value and a work ethic and to be responsible for our actions. It was a wonderful time to be alive because here are mothers and fathers from my generation had come through the depression and World War II to a very, very extremely hard life experiences for that generation which I am talking of my parents. Here we are in the 50’s everybody was sighing a bit sigh of relief on that. That’s where I grew up and how I grew up in a sense. Kevin: Tell us about Chris Hillman, your love for music and when it began and what your early musical influences were and where they came from? Chris: My parent’s loved music. They didn’t play. My mother had to have a little bit of piano playing in her youth and we had this little funny organ in the house and once in awhile she’d go over and sort of mess around on it. It was such a vague memory. As a real little guy I would remember her sort of playing but they loved music Kevin. They had big band music which was their music of their generation as the Beatles and everything was in my generation. They had the big band. They had wonderful taste in music. They listened to Count Basie and Duke Ellington and Louie Armstrong and of course Frank Sinatra and all that. I heard that all through the house. I was swept up being early rock and roll in 1955, 1956, the golden years through 1959 with Little Richard and Chuck Berry and Elvis Presley and Carl Perkins and all of that. I also had this strange thing that was setting off a nerve in me and it was country music. At that time we had a black and white TV. My dad got us a TV. It was about 1953 or 1954 and we would have an area on the house and we’d get a station from Los Angeles which is about 120 miles away. They used to have live music shows on TV out of LA. One was Spade Cooley who was a Western Swing guy similar to Bob Wills. Another was the Johnny Elder Show, which was completely R&B music, Rhythm and Blues. And then there was Cliffie Stone’s Hometown Jamboree and there were all these country music shows and I was fascinated with that. I loved it. My mom and dad were scratching their heads going, "Is this our son? I’m sure this is our son." But that’s what started it and then as folk music came along in 1959, 1960, I was in high school and folk music started coming up in the college campuses and rock and roll went to sleep for a few years. My older sister was in the University of Colorado. She came back with a bunch of folk albums. Pete Seeger, The Weavers, Lead Belly. At the same time the Kingston Trio had come out with a huge hit, Tom Dooley. I spend about two minutes with the Kingston Trio. I said, "They’re really good. It was wonderful. I love this music." But the traditional stuff really got me. The roots oriented music. The Weaver’s songs, Lead Belly singing these great Goodnight Irene and things like that on the 12-string guitar. That developed into even further. So I owe my older sister for opening that door for me. I was like the odd kid in high school who liked country music, blue grass and folk music. But the folk music I liked was very mountain traditional music. Be it banjo, even pre-blue grass. Old timing music, I called it. Gospel music and something in that music struck a nerve with me. And of course I wanted to learn the guitar and of course folks that are interested, I won’t get long winded with you but you can read this on my bio on my website, chrishillman.com. My mother, bless her heart, she stood me down to Tijuana which was about 40 miles away from my home and she bought me a $10.00 guitar. If you stick with this for a year, I’ll help you get another one. And I stuck with that guitar, that old beat up old $10.00 guitar. Can you believe that, $10.00 and a year later she helped me buy a guitar which was about $100.00. It seems like nothing now but because of the way things are costing. I was off and running though. Kevin: So you taught yourself how to play? Chris: I taught myself how to play but then, I got just completely taken in by the mandolin and I’d heard this group, The New Lost City Ramblers which was an old time music group; fiddle, banjo and guitar and mandolin. It wasn’t blue grass music. I just fell head over heels into that. I love the mandolin. I got hold of an old mandolin. I tried to start, tried to learn. I couldn’t. There wasn’t anybody where I lived to teach me and I would drive up to LA with some of my friends, let me preface that. There was a man working at our high school name Bill Smith. He was the custodial guy, the custodian of the high school and he played country music on the weekends. Bill took me under his wing and taught me all kinds of things. He taught me some early mandolin stuff. He taught me country music and guitar and things like that. He was a wonderful man. He just took me under his wing, I mean, a 15-year-old kid. But I would also drive to LA and go to the Ash Grove, which was a coffee house up there and they brought in all kinds of big names, folk acts. I got to hear blue grass and I got to hear the New Lost City Ramblers. That’s where I looked at that mandolin, I said, "Got to learn to do that." I had such a passion for the music that at 16-years-old I worked very, very hard all summer. I earned enough money to buy this mandolin, an old Gibson, and I found out there was guy up in Berkley, California who could help me, teach me some mandolin. He was really a good player. I took a train from Del Mar California, 500 mile trip. Took it up there on my own, went to his house and he gave me a couple of lessons. Got me set on the right course just technique wise and I went on home and practiced. I learned off a record just like everybody else my age. All the guys that came into music, my peers, so to speak, we all learned off the records. We didn’t have a DVD instructional video the kids have now. We learned off records. We learned by watching, we learned by playing and sharing. There was such a passion amongst the very few or the very small family of people that wanted to learn how to play. No one ever thought they’d make a living of it. It was just pure love of it. That’s what started me. I went from there into a few bands and early blue grass bands and things. Had some wonderful people that helped me along the way. One of which was Vern Gosdin and who was very, very big country star in the 80’s and 90’s, No. one singles and things. He at that time, 1963 rather, after I got out of high school, I was in a group with him and he was living in California with is brother Rex and another fellow Don Parmley. These guys were right out of the south, they were from Kentucky and Alabama. They were older than I was and we worked in Hillbilly bars. I had a fake ID. They learned country music and blue grass music from listening. They sang it. It would give you chills. When they did Gospel music it was just so beautiful. Kevin: Now you are 16, 17 at this time playing in honkytonks, if you will. Chris: Right there I was just about 18 at that time. But prior to that my professional thing was I’d play coffee houses with the other band I’d been in the first band, that’s The Scottsville Squirrel Barkers which we still get together once in awhile and play. There’s one fellow who passed away but that was my first time at age 16, 17. Kevin: Bring us up to The Byrds, that is, how is it, first of all I guess that you were recruited to play for The Byrds, and then, how is it that you were recruited to play base guitar which if I got the story straight, you really had not played before, you are as you said, a guitar player and a mandolin player. Chris: Right, sheer luck Kevin. I had a fellow that I’d met who was helping the band I was in which was called The Golden State Boys. This is the band with Vern Gosdin and Rex and Don Parmley and then it became known as The Hillmen. I don’t know why I didn’t really have a pivotal part of that band. I was the young kid in the band. This fellow Jim Dickson was working with us in the studio and recording us and trying to get us a record deal. We were all sort of all in LA at that time. But along comes the Beatles, turns everybody head over heels. What a wonderful band that was when they came out. All of a sudden I had gone off and I had quit the band I was in The Hillmen and I was working for this other group, just temporarily because I could make a little money to survive. And then Jim Dickson calls me and he says, "Come down and listen to these three guys sing." And I said, “Who is it?” He said. “It’s David Crosby.” He says, “You know these guys. They’re always going down to the Troubadour Coffee House and singing on open-mic night on hoot night,” they called it. So I go down and listen. I had certainly been accustomed to that level of proficiency in vocals because I’ve been around the Gosdin, just unbelievable. So David was going to be the base player and so I had listened to him. I said, "This is great gosh, this is terrific." So I went down and I was praying, “God get me through this. I don’t know what to expect.” Well when I got down there, nobody was that proficient. Everybody that was in The Byrds, every guy from The Byrds came out of folk music. We didn’t know how to play rock and roll. I mean, literally we plugged our amplifiers into the wall and onward we went. We had no blue print. We weren’t a garage rock band. We had no experience with that. So I was OK. I faked it for awhile. I’d figured it out and I played the base, I approached it like it was a blue grass rhythm guitar part and I can really safely say in all honesty, I probably didn’t really figure out the base till the second Byrds album. It was OK but here’s the interesting part of The Byrds, Kevin. Because we had no blue print and we had no experience as a rock bank and we were sort of emulating the Beatles at the beginning and basing it around Roger McGuinn’s guitar playing goose. Roger was the most experienced musician of the bunch. They had already put in a lot of time as an accompanist with other groups and it was really quite a good guitarist at that time in the early days. So we developed a sound around Roger’s 12-string and by hook and crook, I mean, we developed such a unique sound basically because we were isolated and we just created the sound. Now when we look back, I look back at The Byrds, I said we left an incredible musical legacy, a musical path for other bands to follow. We didn’t make that much money. We had hit records but at the time it wasn’t quite what it is today. I got in there, I played the base. I learned how to play the base. I learned how to play with the drummer and I listened to some of the most beautiful music and played some of the most beautiful music I ever had done. To this day there are a lot of songs that I am extremely proud to have been a part of. Kevin: What are your favorites, by the way, your favorite Byrds tunes? Chris: Well I’ll tell you something. If you were to say what one song describes The Byrds in its entirety? I would say a song on the first album, The Bells of Rhymney. The Bells of Rhymney is an old Welsh coal mining song. Pete Seeger had recorded it as a folk song. It is a folk song and we did it. It has this rolling feel to it. Michael’s hitting the drummer, Michael Clark is hitting the cymbal. It’s like the bells and it’s beautiful, almost Gregorian vocal chant type thing is coming through. “What will you give me”, said the sad bells of Rhymney. To me it was the greatest song we ever did. Now granted I love Turn, Turn, Turn and I love some of the other songs we did. I thought we did a great job on Turn, Turn, Turn. We even got a laugh when Pete Seeger about that, that he was very happy with the way we did Turn, Turn, Turn and Pete was such a purist. I always tell people when I sing the song on stage now, I said, “There were two authors to this song. One was King Solomon. His heirs do not share the royalty. And the other was Pete Seeger who took these verses probably out of the King James translation, changed them ever so gently but added the chorus. He wrote the chorus to everything, Turn, Turn, Turn. There is a season, Turn, Turn, Turn as the world cycles. Our life goes through that cycle and the time to be born, a time to die, a time to plant, a time to reap. Basically such beautiful lyrics as Solomon’s proverbs were and Ecclesiastes and so there you have it. That song alone, if I have done nothing else except that song, it would have been something to always remember fondly. Kevin: I think Tambourine Man was also a great rendition and certainly Turn, Turn, Turn and Pete Seeger of course is one of our greatest of American Poets in my opinion in addition to being a great song writer. The idea then, Chris Hillman, of covering folk tunes electrically, the Dylan’s and the Pete Seeger’s, that really came out of the group organically then because that was your roots? Chris: It came out because of our roots. Our manager at that time was very wise. When he told us he said, "You guys remember something. Go for substance. Make records you can listen to in 30 or 40 years." What he was saying is go for that depth, that substance on the lyrics. Yes we did start out doing Dylan songs which were beautiful and beautiful stuff he wrote and Turn, Turn, Turn and things. Then we really became a really good band within a year as a musical unit and we progressed to what we were doing, a song like Eight Miles High for rock and roll. Well Eight Miles High was way out of left field. It’s almost a jazz composition and that was just the evolving nature of the band, of The Byrds. I thought we had progressed beyond covering Bob Dylan songs into our own identity. Of course we also had Gene Clark as a song writer at that time. And they’re not the same thing. Roger was a good song writer, David was a good song writer but Gene was just so prolific and he wrote such beautiful lyrical passages. Things were really rolling along there quite well. I sat back and I got to tell you, I was the guy in the back. Very shy, played the base, did my part and absorbed as much as I could and learned as much as I could. They were a little older, David and Roger were older than Gene and Mike and I. At that time in your late teens or early 20’s a three year difference is like a decade but I learned quite a bit working with those guys. And then at the right time, as God willed it, I stepped into the front line and became a singer. Not really, I wasn’t a very good singer for a few more years to figure that out but I started writing songs and singing it and it progressed into that area. Kevin: Did you have any idea, Chris Hillman, at the time like you say in your late teens and so on, that you were on the way to rock and roll fame and legend as we say? Chris: Well it dawned on us when we heard Mr. Tambourine Man for the first time on the radio. We were together driving in a car in Los Angeles we heard it on the radio. That really was an impact. I think far more for Roger who was the singer on it and David and Gene, the singers on it. But it was a big impact to hear your song on the radio. Of course it just started to fall into place. We were doing a lot of television and getting a lot of adulation and all of that. Being young guys and subject to many temptations and I don’t mean that in a bad way yet, we’ll get into that later but what I’m saying is we were swept up into it quite quickly at a young age. Our manager did keep a tight rein on it. Now he’s driving the stage coach and keeping us in line. So it’s progressing really quite well and it was. I had no idea. I always said I had such a passion for music Kevin. I thought I’d play for long there and try to go back to college. I did like a semester at Junior College at some point in there in that period before The Byrds. I thought well I’ll go back to college. Every year something would happen. The Byrds took off, a great run from late 64 to 68, for me. I left in late 68. Kevin: Was Mr. Tambourine Man number one I think was on the billboard charts? Chris: It was number one in America and in England. Quickly caught the attention of the Beatles and they were quite taken with our band and for a brief period we’re telling everybody this best band in America was The Byrds. We got to know them and meet them and they came to one of our session at Columbia Records in LA. Kevin: No kidding. That’s not the only famous band that took notice of your musical. We’ll get into it a little bit later but one of the pieces of information I picked up along the way was that the Stones, Mick Jagger and Keith Richard wrote, tell me if this is right or wrong, wrote a song, the country inspired tune Wild Horses, kind of an homage to one or bands with Gram Parsons, the Flying Burrito Brothers is that story true? Chris: I think so. I think Wild Horses was a little inspired in their meeting. We had known the Stones from The Byrds. I’d known them. We opened a tour for them in California but I think when we got reacquainted in the Flying Burrito Brothers with them, yeah I think they were there. What they really did was give us Wild Horses to record before they did it. Nice song. Not one of my favorites in all honesty but it was OK. I think they did it better than we did. Kevin: Let’s talk a little bit Chris Hillman about where you were at his point in your life? You’re up and coming. You’re opening for a famous band. You’re hobnobbing with legends in the rock and roll industry. The cultural times that we’re in, Vietnam and the whole bit. Where were you spiritually at this point in your life, in your 20’s and when did you start to get serious spiritually speaking. We’ll weave through various other career phases as well. Chris: At that moment in the early 60’s I was pretty much spiritually asleep. OK. I wasn’t attracted to any of the cult-like religions, I use the word loosely, that were prevalent during the early 60’s hippie era. I didn’t even buy into the hippie thing. To me Kevin, the 60’s, the best part of the 60’s was the very early part of the 60’s up until the aftermath of John Kennedy’s assassination. When the Beatles came over which I always thought was a healing force for our country and the world when they came out with that wonderful upbeat music. But from that period, late 63 to 68, was the 60’s to me. When 1968 rolled in it got real edgy. We were on the verge of anarchy in this country. We had unbelievable drug problem beginning. I played the Monterey Pop Festival, it was 1967. It was just idyllic. It was a beautiful time. Everybody got along. There weren’t any problems with substance abuse. There were but nothing to that degree that happened in the Woodstock and all that. I played Monterrey and then within a matter of two years I played Altamont where the man was killed on stage. This was dark and satanic. I was not spiritually active at that time. As I say the 60’s took a wild turn into the dark side in 1968 and continued into the next decade and to the next decade. I had a bit of Presbyterian upbringing. My mother’s cousin was a Minister, Pastor of the church near our home. Once in a while we would go to church. It wasn’t an active thing. I wasn’t well versed in scripture or anything. I knew nothing. I really knew nothing. As on the side I accepted Christ in 1972 with Al Perkins who was a very devote Evangelical Christian and had been in the band, in the Flying Burrito Brothers with me and then came with me to Manassas and I accepted Jesus with Al and prayed with him. But Kevin, I turned back for the next eight years. Did not reacquaint and asked for forgiveness and accept Christ back into my life until 1980. In 1972, after I had left the Burrito Brothers and I was asked to join this band Manassas with Steven Stills we’re moving ahead. When I was in Manassas I did accept Jesus but I didn’t follow through on it as a Christian. It was almost like that old funny anecdote, The Foxhole Conversion. The man’s in the fox hole amidst the battle, “Dear God in heaven, please let me survive this. I will follow the tenets of Jesus for the rest of my life. Of course as soon as the battle is over and he’s fine he forgets about it. That’s the old foxhole conversion. That’s what I went through. As soon as everything was fine I went, “Oh, you know.” The world’s got hold of me again. It’s my best way I can put it. The world grabbed me and held on to me for another eight years. Anyway from Manassas 1972, which was musically a great band, worked with Steven Stills and worked for two years and then I went into another group and another group and did a couple of solo albums throughout the 70’s. The 70’s were a very indulgent decade. There were a lot of people that I lost during the 1970’s one of which was Gram Parson’s who I loved dearly. Gram and I started the Flying Burrito Brothers. Gram got really seduced by the dark side and that eventually killed him. I lost so many people during that period of time that one decade of the 70’s. I think Satan was working overtime then. Kevin: For the record, Gram Parson’s died in a motel near Joshua Tree National Monument in 1973. What impact did that specifically have on you, Chris Hillman, seeing such a talented such a talented young friend die in his prime of life at that time? Chris: Well it was something that wasn’t unexpected because I’d have to fire him from the Flying Burrito Brothers in 1970 because of his drug use. I had to fire him. We had started the band together and he kept showing up drunk or stoned or whatever, late for shows. In fact there’s a great story, Kevin. We had a show to do in early 1970. It was a little suburb of Los Angeles and I couldn’t find him. The Rolling Stones were recording in the studio and I realized he was down there. So I go down there, I come in to get him and I’ll never forget Mick Jagger saying, “Gram you have a responsibility. You have a show to do and we’re working here and Chris is here, go with him please. We need to go to work here. You have a responsibility”. I took him and dragged him into the car and gathered some coffee and got him straightened up and we went into the show poorly but we did it. But, the one side was Jagger, the consummate professional, knew when he had to do work. I mean look, they’re still working. It got to the point where I had to fire Gram because of his drug use. I loved him dearly but at that point there’s nothing I can do. You cannot march somebody into, you can be there for them, you can love them, you can forgive the sinner. It’s only so much you can do, until they seek your help or they seek God’s help. I was expecting something was going to happen because he had left after the Burritos and his drug use doubled. I saw him again and it was an unpleasant situation where I had to remove him from my house, physically remove him as he was just horrible. In a matter of months he died but he had a tragic childhood and all of the above but that does not give you license to make. You make your own choices. We cannot use anything in our childhood or background as a crutch through life. Hence the beauty of Christianity, where you are forgiven, unconditionally forgiven for any of the past grievances and sins. And I believe Gram had a Christian heart and had a sense of it but it was just overwhelming. Sometimes the evil one is so strong and can overwhelm and he got him, he got Gram. That happens and it’s sort of hard and you keep going and you’re going, “Oh my gosh this business. What is it, it’s like Satan’s playground, the entertainment business.” It still is Kevin, it still is. You see these young kids getting into drugs. They go to rehab, dah, dah, dah, dah. Kevin: Whenever we are drawn to any idols whether it be pride in music, all of these things, we are tempted by the dark side as you pointed out. How, Chris Hillman, did becoming a conscious and intentional Christian believer change and or impact your life and your music at this point. I want to throw in there that I know that at some point you hooked up, so to speak, using your parlance, with ex-Poco leader Richie Furay who became himself an Evangelical and now a Pastor. Was he any influence along the way? Chris: Richie and I got into this band which was The Souther Hillman Furay in the mid-70’s and it wasn’t a good band. It was good idea but it just never worked out. Richie was having unbelievable problems. I was too at that time. He did reach out and Al Perkins once again was in that band so Al had been to three bands. Al was like spread the word. He’s an incredibly beautiful soul. He’s brought more people to Christ and he got Richie. He brought him into Christ and Richie got through it. Richie influenced me but I still hadn’t made that step and it took me a few more years. You see, I turned my back on Jesus but he didn’t turn his back on me. He just waited for me. I got married in 1979 to this wonderful woman [mumble] we are celebrating 30 years in October. That was a big change too. I survived. I feel that I survived some very tumultuous times. First of all I survived because I firmly believed my parents brought me up with such good values. I think the first 12 years of a child’s life are some of the most important, probably the most important in their life. The things that you were instilled with will get you through some pretty tough times. I made it through those tough times and believe me I had one foot in the abyss for awhile there, but then I found God again and in the early 80’s. Of course Riche at that point was also firmly immersed in his quest to be a Calvary Chapel Minister. I believe he came out of the Chuck Smith Calvary Chapel ministries. I was baptized. I became an Evangelical Christian. Kevin: Also on Calvary Chris? Chris: Pretty much through that Calvary Chapel type church. I really found myself and found a clear path and was doing Gospel records. I was making Gospel albums with a lot of the other guys. It was quite an enjoyable time. Now I’m going to interject. I’m married. We had two kids in the 80’s, 1983 and 1988. My wife Connie was Greek born in the Orthodox, Greek Orthodox Church. Kevin: A-huh here’s the link coming. Chris: She’s never, ever pressured me to convert to the Church. She was patient. She baptized the children in the Greek Orthodox faith. I would go certain days during in the church here of course. Holy Week I would go a couple of times maybe. I was not in the church and had strayed from my Evangelical Church going to at that time. He said, “Have you been baptized?” I said, "Yes." "Will you recognize this baptismal certificate?" He said, "Yeah." And then I went and saw him and talked to him for weeks. What was the first question I asked him Kevin? Why do you have icon? Those are common questions. Why do you have icons? He said, great answer, "You got your wallet on you?" I said, "Yeah." He said, "Open your wallet. Do you have a picture of Connie and the kids?" I said, "Yeah." He said, "Why do you carry that around." I said, "So I can remember them always in my heart." And he said, "And that’s why we have the saints, the icons of the saints in the church, that we remember them, that we revere them always. That it opens us up to the Holy Spirit". I went, “Wow.” That really hit a nerve with me. Well after going and talking to him for three or four visits, I was Chrismated and I had a lady who was one of Connie’s distant cousins who was my godmother, whose still is today alive, my godmother. I kept my name of course Chris. I’ve never looked back. I’ve never, ever felt so fulfilled yet I know nothing. It’s the tip of the iceberg. Everyday I learn something new about the Orthodox faith. It’s very hard to describe it to other people who don’t know it, you know that. It’s been 12-13 years now since I made that step and I can’t tell you how fulfilling it is and all of the priests that I’ve met, and loving people, and what a wonderful family, and what a wonderful faith. Then of course I got into the choir which I love doing because I’m singing really the Byzantine chants. One of the priest said, “You’re the only Hillbilly tenor in this big Orthodox Choir.” I said, “Yeah.” And he said, “Probably in the United States.” I said, “Yeah.” But I said, you know what’s funny Kevin, I said the singing in the choir actually enhances what I do on stage. I still do a lot Gospel material on stage. If you were to break it down as to what kind of Gospel music, it would be sort of a Baptist, southern Baptist old time Gospel songs that I love the old way they did that. What I do on stage probably enhances my part in the choir. I love the vocal and singing parts. I just recently did a music and ministry retreat at St. Demetrius Church at Camarillo, California where I describe the old Baptist hymns and how they relate to our church music in the orthodox faith. Anyway, there you have it. I did go to the monastery at St. Anthony’s in Phoenix, outside of Phoenix a few years back. What an experience that was. I felt like it was 300 AD. Kevin: I know, yeah that’s amazing. Kevin: Going back a bit Chris. You mentioned a couple of things, as we’re coming to a close, but I want to see if we can cover them fairly briefly. You mentioned fulfilling and it’s hard for people to understand what that means. I’m led to use the word more and more which is also difficult to understand or to really articulate what we mean and that is fullness. By that I mean that we’re not here saying that as evangelical Christians we didn’t have Christ. I think what we’re saying is that it’s the fullness of knowing who Christ is in the context of the Holy Trinity and the Christian tradition. Chris: I used to have great conversations with Richie Furay two summers ago when we were on the road together. I’ll go to that in a second. What I feel, what good thing about the Evangelical Church is scripture that you do learn the bible, OK and I’ll get into that too. We in the Orthodox faith have an option every morning to read our daily bible reading that is given from the archdiocese, which I do, which I think is a great thing. You don’t have to but I love it. Especially during Pascha Easter. Fulfilling to me is the liturgy, I feel the living Christ. I feel this mystery come down into our church. Wherever I am Kevin and wherever I can go to church, if it’s in Seattle Washington or San Diego or wherever I can to a liturgy. I know a lot of the Protestant churches are now rediscovering the sacraments maybe on a monthly basis. Maybe sort of a superficial thing but it is a very, very special moment. As I say, I feel I’m experiencing the living Christ in me when that happens. I’ll tell you something interesting and once again I’m not passing judgment. I have two friends, dear friends in my age group both brought up Catholic. One is active, one is not. Both of them had no idea when it was haphazard conversation one day. We were talking about well the unworthiness of man. That we are constantly striving and I said, “Both times,” within a monthly period. I said, “Look what some of the saints had done in their lives.” They would have been murders, terrible people, prostitutes. I get these blank looks. I said, “My gosh look at St. Paul who orchestrated the death of our first martyred saint, St. Steven and they didn’t know what I was talking about. They didn’t know who Paul was. OK that… sort of weird to me. I was taken aback by it. Then I realize, well they don’t read a lot of the Bible in the church. I mean they do know but they don’t know, if you follow what I’m saying. I guess what I’m trying to say is that there are certain parts of the protestant church or anything that can offer the scripture to be looked at and studied. The Orthodox faith does offer Bible study on 99% of the churches I’m sure plus your daily Bible reading. The old adage, to understand the New Testament you have to know the Old Testament and to understand the Old Testament, you have to know the New Testament because of the prophecies and all of these fulfillment of those prophecies. Kevin: I’m sorry that our time is up. My guest has been legendary musician and Orthodox Christian Chris Hillman and for information about Chris and his career and his music and his upcoming tour dates, you can check out his website. Chris give your URL on that please. Chris: Oh it’s just chrishillman.com. Kevin: Chris Hillman thanks so much for being my guest on the Illumined Heart.